The Pyramid Force Pearl delivers what other balls only dream to achieve. Cosmic Collision. Force Pearl is propelled by the SG Precessional Asymmetric core. This new medium RG and differential engine creates an unbelievably strong, consistent ball motion, bringing tremendous energy transference to the pins. Paired with the Silver GPS Navigational Pearl coverstock, Force Pearl delivers breakneck angular power and effortless energy transfer to the pins with a sleek look. Finished at 2000 grit Abralon factory finish polish, expect to skid easily through the heads for an unsurpassed angular move on the backend. Cosmic Collisions ahead with the Force Pearl. Lighter colored resin swirls/lines are common on the Force Pearl. 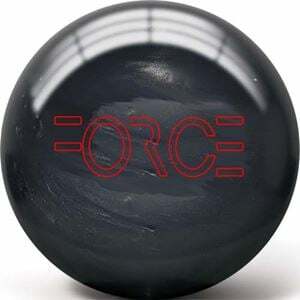 This is a product of the manufacturing process and doesn't affect ball reaction in any way.